New Age Movement in more recent years, growing gradually and imperceptibly, and gets into all areas of our lives. The movement soon grew secretly but since 1984, when he was commanded to publish and spread as far as possible it can be seen everywhere. It links all the Eastern religions with spiritism, which is already getting into Christianity. They have one goal - the establishment of a new world order to be restored through a total unification of thinking and then by co. The basis of this system is the belief in some kind of "inner government" over our planet, implemented through a hierarchy of spiritual beings or masters of wisdom, which are actually demonic beings. All the wisdom, plans and tactics drawn New Age movement of spiritualism. Its leaders make no secret of the fact that it draws from the demonic beings and their leader is Lucifer himself. Themselves were the founders of spiritualism and the media makes clear that their sites are illuminated with light of Lucifer. They get into our subconscious and consciousness are increasingly promoted by the Eastern relaxation techniques, meditation, yoga, hypnosis alternative medicine. Most people are influenced by so-called 'wave of fantasy, "which is offered in films, audio cassettes, books, toys and social games, wherever it occurs the supernatural, aliens and demonic creatures, or just a fairy and so-called natural beings. Also, UFO, crop circles and mysterious everything comes from Lucifer. The most powerful means of influencing masses of people, of course, music. Even Alice Bailey, led spiritualism gave instructions to "Music Therapy" which is part of the training of people. Appeared on recordings with the "spherical music". In Christianity, they are again spiritualistic phenomena Virgin Mary, weeping statues, crosses and many wonders that look like real, including the healing of diseases. Satan has great power and can do wonders that people can not understand Jesus warn us, and he warned. All this leads to single targets. Connecting the world to come to the so-called new era of our country, where everyone was happy and in harmony with nature, and was finally able to come messiah Maitreya, who already lives here and is waiting to prepare humanity. In June 1988, one of the followers of Maitreya stated that the sign of his presence in the world will grow. "I'm going to flood the world with such events that the human mind is understood." Weeping and bleeding statues, crosses and healing light sources, messages written on the seeds of fruits and vegetables, bronze and stone statues drinking milk, an increasing number of UFO sightings, crop circles, luminous phenomena in the sky. Through the ever-increasing number phenomena about which the media has been all over the world, has Maitrea touch the hearts of millions of people and prepare it for its early public exposure. New Kingdom, and indeed the Messiah comes, Jesus Christ, his death, save us all come in the glory of heaven with the angels of heaven, and every eye shall see him for the whole country. Before it does happen, the old devil, Lucifer, do imitations and seduce the whole world. The Bible clearly says that before Jesus comes after another has come that reprobate, and elevate the issue to God. 2nd Corinthians 11.14 - and no wonder, for Satan himself is transformed into an angel of light! 2nd Thessalonians 2,3-12 - Do not let anyone deceive in any way. Until that day comes, there needs to be turned away from God. They must discover the wicked and reprobate, who opposes and exalteth himself above all that what it says and what God is worshiped. Settle even in God's temple and will issue a God! Do you not remember how I told you when I was still with you? You know what prevents him yet - may in fact occur until that time. The secret of this wickedness, but it works, just waiting for it to disappear the obstacle. When he discovers that the wicked, the Lord Jesus will kill him the breath of his mouth, destroying its brightness it coming. 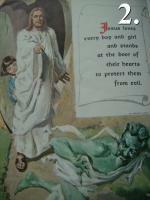 The advent of the wicked will become Satan's activity, all the false powers, wonders and miracles. With all the folly is to deceive those who are heading to disaster, because he did not love the truth, which could save. Therefore, the issue over to God delusion to believe lies. So they sentenced all those who believe the truth but had pleasure in infamy. 1 Timothy 4.1 - The Spirit clearly says that in recent times, some people leave the faith to follow wandering spirits and demonic teachings. Matthew 24,4-5 - Jesus answered them: "Be careful that no man deceive you. Many shall come in my name, saying, 'I am the Christ' and shall deceive many. Matthew 24.11 - And many false prophets will arise and deceive many. Matthew 24,23-25 - If you if someone said, Behold, the Messiah is here! " or, 'Here it is! " trust. Arise false messiahs and false prophets, and will do great signs and wonders, so to deceive (if possible) even the elect. Behold, I have told you beforehand. Revelation of John 12.12 - but woe to those who live on land and at sea, as the devil is come down unto you, having great wrath, because he knows his time is short. Matthew 24,26-27 - says to you, 'Look, is in the desert! " go not forth: or, 'Behold, he is a secret place,' Never. The advent of the Son of Man comes like lightning - light up the sky from east to west. Revelation of John 13,16-17 - All small and great, rich and poor, free and slave lets put a sign on the right hand or forehead so that no one can buy or sell, not if it means - or the name of the beast the number of his name. Revelation of John 13.13 - he does great wonders, has it even the sight of men came down fire from heaven to earth. Deuteronomy 18, 10-13 - Whether to be found among you who would be your son or daughter made fire! Likewise, no seer, clairvoyant, fortune-teller, magician, snake, auctioneer spirits, psychic or who consults the dead. Anyone who commits such a thing is sickening to the Lord! Mark 13,14-23 - "When you see the ONU, a shocking outrage" as is, where it would not (let the reader understand), then let those who are in Judea flee to the mountains. Who will be on the roof, both miss the house to take anything away. Who is in the field, whether or not return for the mantle. Alas, in those days for pregnant or nursing. Pray that it was not in the winter. Those days are days of trouble is what to this time since the beginning of God's creatures and they never will. If the Lord shortened those days, could be rescued no one. Due to his elect, however, the days shortened. If then someone said, Behold, the Messiah is here! " or, Look, there! " trust. Arise false messiahs and false prophets, and shall do signs and wonders, to seducing (if possible) even the elect. Be careful then. Everything I've said before. " The world at the beginning of the nineteenth century began to bring God's message was a man's world. Her prophetic calling it exposed a critical examination. Did the Bible's criteria and his prophetic gift was used for over seven years. Since 1844, when she was seventeen until his death in 1915, received more than two thousand vision. Ellen White's writings do not replace the Bible can not be equated with Scripture. Only the Bible is a unique measure, which must be considered her writings and other literature, which must be obeyed. Ellen White herself believed and taught that the Bible is the supreme norm for the church. In her first book published in 1851, wrote: "I recommend you, dear reader, the Bible - the Word of God as your rule of faith and life. This word will be judged. This view has never changed. Ellen White recognized that its mission is to lead people back to the Bible. "Just a little care to the Bible, she said, because" the Lord has given a lesser light, which has lead people to greater light. "The supreme act of great drama of deception is Satan's imitation of Jesus Christ. Church long argued that the expected arrival of a savior, as the fulfillment of their hopes. God's foe seemingly imitating Christ's coming. In various parts of the world's people, Satan emerges as a noble creature dazzling beauty, resembling the Son of God, as described by John. (Revelation 1, 13-15) fame, who will surround him, surpass anything yet seen the human eye. You will hear a triumphant cry: Christ is coming!